To Make Lemon Pudding Take 7 Eggs, 6 oz of loaf Sugar, 2 table-spoons full of Cream 1/4 lb of Butter Melted, the juice and peel of 1 Lemon, Mix all well together, and put a crust into your pan then put your pudding in the oven and bake it. I put in half the Butter and 4 spoonsful of cream instead of 2. Mrs. Howe Sewd. receipt. 1852. A Pound Cake. 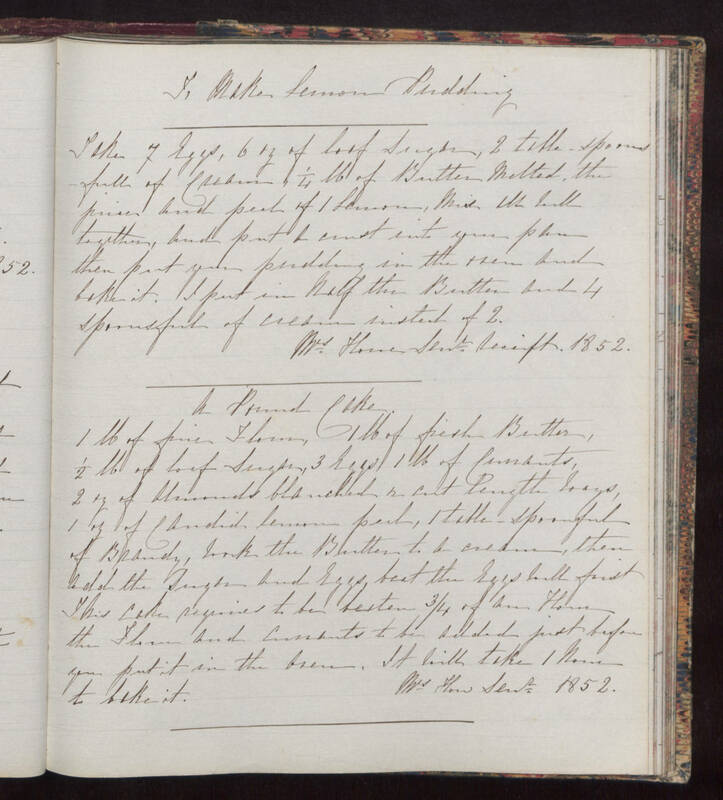 1 lb of fine Flour, 1 b of fresh Butter, 1/2 lb of loaf Sugar, 3 Eggs, 1 lb of Currants, 2 oz of Almonds blanched or cut length ways, 1 oz of Candid lemon peel, 1 table-spoonful of Brandy, work the Butter to a cream, then add the sugar and Eggs, beat the Eggs well first This cake requires to be beaten 3/4 of an Hour the Flour and currants to be added just before you put it in the oven. It will take 1 hour to bake it. Mrs How Sewd. 1852.